Wine has a greater potential to develop complexity and a more aromatic bouquet it is allowed to age in a cool, consistent environment. A temperature range from 55° to 60°F is considered to be optimal for the biochemical development that occurs as fine wines mature. Any temperature fluctuations should be minimal and gradual. The lower the temperature, the more slowly your wine will develop. Wine contains living organisms which will become spoiled or "cooked" when exposed to high temperatures (above 77°F) for long periods of time. Dramatic temperature swings can also cause adverse chemical reactions in wine. The exact length of time that it takes to ruin a wine will depend on the type of wine and the amount of heat. Wines that are exposed to high temperatures during the winemaking process, like Madeira, can handle high temperatures better than delicate wines, such as Riesling and Pinot Noir. When a bottle has been exposed to excessive heat, the cork may push out from the bottle, or the wine may leak out. However, in general, it is difficult to identify wine that has been stored inadequately until the bottle is opened and you detect the raisiny or stewed flavor of a cooked wine. Maintaining humidity in the range of 60 to 70% is important for the optimal storage and aging of fine wine. When conditions are too dry, the cork can become brittle and shrink. Wine may leak out of the bottle, and excess oxygen can seep in and oxidize the wine. When conditions are too humid, wine labels can become damaged and mold can grow inside the cellar. In some parts of the country that aren’t too dry or hot, you can achieve proper wine storage conditions without a refrigeration system. However, when ideal conditions don’t exist naturally 12 months a year, wine cellar cooling units can maintain those conditions. The best cooling units will ensure temperatures in the recommended range with minimal fluctuations while also maintaining ideal humidity inside the cabinet or cellar. 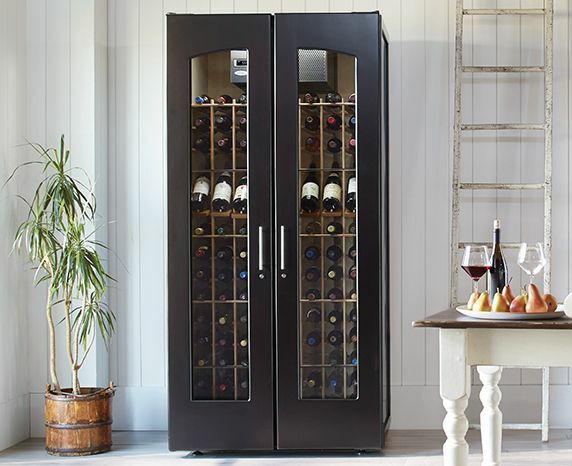 A cooling unit should be sized to handle the peak temperature that your wine cabinet or cellar will be exposed to, so that it can maintain your desired storage temperature even during the hottest time of the year. You should note that noise and cooling power are linked. Larger cooling units, designed to maintain optimal conditions in bigger spaces, will be noisier than smaller units, but noise levels vary among manufacturers. CellarPro cooling units, included in all Le Cache wine cabinets, are designed to maintain cool, constant temperatures with digital precision, while providing ideal humidity levels inside the cellar—even in the toughest external conditions. Our units are the quietest on the market and are backed by the best warranty in the industry. Read more about our cooling units and their advantages. Questions about wine storage refrigeration or cooling units? We're happy to answer. Give us a call toll-free at 1.877.532.2243 or ask us through a live online chat. You can also use our contact form.